Following the Timmy Kaine Money Trail of Shame | Virginia Right! 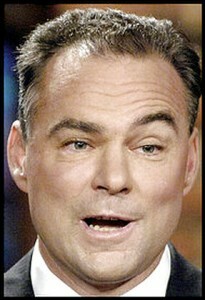 So, what is Timmy Boy Kaine up to these days? Well, after leaving his job as Virginia’s Governor and abandoning the state with largest budget shortfall in history, costing the Democrats any hope of winning much of anything in Virginia for a long while, Timmy was “promoted” to the position of Chairman of the Democratic Party where he promptly presided over a historic defeat in the US House of Representatives and helped Republicans draw closer in the Senate to regaining control. So, with the equally talented Wasserman-Schultz hoping to carry on as the latest puppet for the Food Stamp President Obama, Timmy Kaine was free to run for the Senate where he could finally talk in big money deficit terms. No longer stuck in a dead end job managing to spend only a billion or so more than Virginia took in, Kaine is ready to play the Trillion Dollar Loser game with his BFF Barack in the Major Leagues inside the Washington beltway as a US Senator. Of course, as one can expect, all the Progressive lefties lined up to pay tribute to what they hope will be the Senator who finally teaches the world what comes after a Trillion. Unions, of course, are all in. Now, we already followed Tim Kaine’s donations from the arch enemy Bain Capital, Mitt Romney’s former employer. 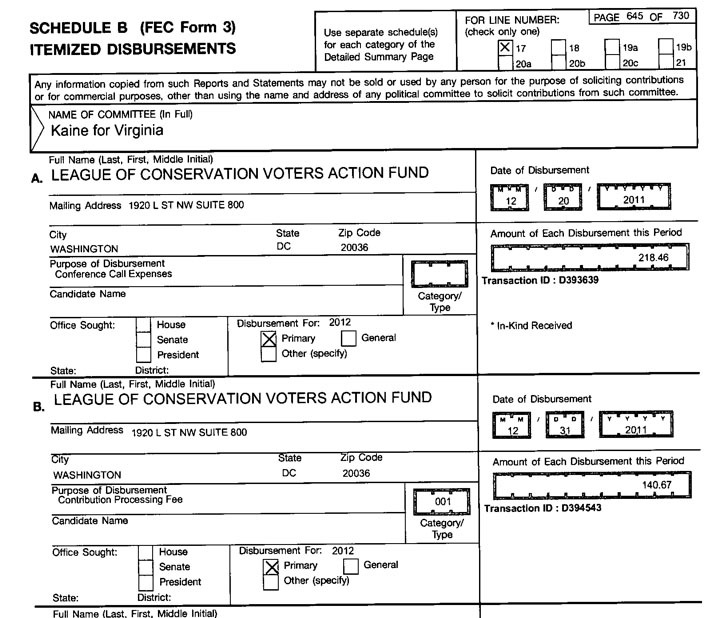 And it is not really a shock to see the League of Conservation Voters in the donation column for Kaine. While pretending to be fair and balanced, the LCV is a far left extremist group that is out to push the Democratic agenda. They are really big on politicians who vote for things like giving millions and millions of Taxpayer dollars – actually, they won’t technically be Taxpayer Dollars until we pay China back for the loans, to pillars of clean energy achievement like the bankrupt solar energy company Solyndra. So, in digging through Timmy’s Federal Election Commission filings, I came across some interesting tidbits. Feel free to click on the image to see one large enough to read. 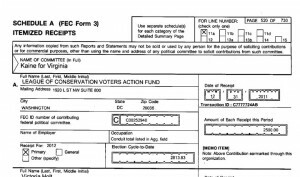 But what we see is that Timmy paid the League of Conservation Voters $218.46 on 12/18/2011 for “Conference Call Expenses”. 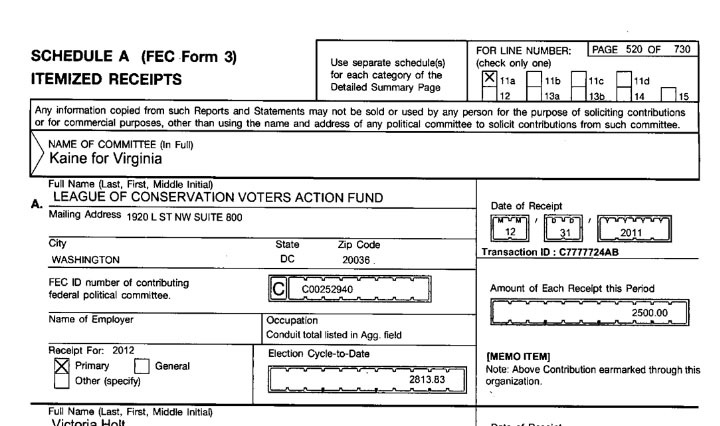 The second item on this page shows $140.67 going to the LCV for “Contribution Processing Fee” on 12/31/2011. 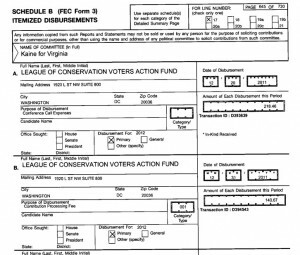 Not a lot of money, but when you combine these three items with the fact that the LCV just so happened to name the presumed Republican nominee George Allen to their “Dirty Dozen” list, well, it’s enough to make even Tim Kaine raise an eyebrow. I can imagine how that conference call went. I could just envision Kaine dialing into the conference bridge and punching in the code number the LCV sent him to join – who knows how many left wingers – in a strategy planning session. Now, I wasn’t actually on that call, but I couldn’t see it going a whole lot different from my fictitious version. What else does Tim Kaine have to offer? But I would like to dedicate a song to Timmy in honor of his work for Obama and personal prowess with debt.